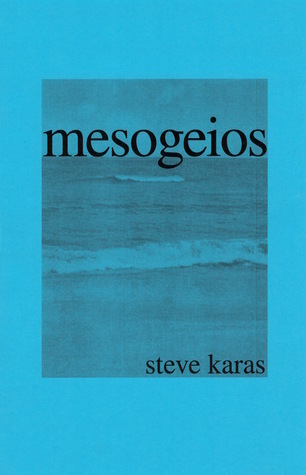 There isn’t a smidgeon of fat in Mesogeois, Steve Karas’ newest collection containing five stories barely forty pages in length. There is never a gluttony of adverbs, run-on sentences, nor introspection that wanders off the side of a cliff. If anything, there were instances when I might have craved some marbling in the meat in order to savor the passages a little longer. What you do get is an honest introduction to Karas’ succinct and simplistic way with words and his punctual content that never lags on the superfluous. The vignettes fluctuate greatly in perspective and anecdote, and each story contains a narrative voice of its own, set in different timeframes spread across a variety of timelines. Life is about having health and finding true love. She shrugs. What else can it possibly be about? She dusts her hands off to signal that’s it, that there can’t be anything more. Don’t forget me, she tells you. I could never forget you, you say. It’s the last time you ever see her. Invisible Strings takes on the bizarre fad of an air guitar championship. A sixteen-year- old Greek boy grapples for glory in hopes of becoming the next YouTube star. Although his lust for the spotlight distracts him from his obligations to his brother and family, his shallow dreams prevent him from getting involved in violent and xenophobic initiatives. His naivety reminds us that although our worlds may be in shambles, we must find strength in our connections, art, and individuality. Wherever Karas chooses to set his scene, he challenges himself by taking on a range of perspectives and landscapes. From young to old, male to female, foreign countries to transitional backdrops such as airports or airplanes, Karas is a writer who refuses to settle into his comfort zones, and refuses to accept a passive and complacent single point of view in his writing. Highly commendable, and in the literary space, this approach not only fills a gap in the diversity of narrative voices, but he’s also fine-tuned his ability to write from countless angles. An eclectic short story collection that shouldn’t be overlooked as 2016 comes to a close.